The Panthers travel to Champaign, Illinois, to face three tough challengers including a pair of ranked teams in No. 8 Illinois and No. 10 Creighton. The Panther defeated Creighton in the first match of the season. The matches are the last before starting Missouri Valley Conference play next week. • UNI swept its way through the Ball State Active Ankle Invite last weekend topping Ball State, Indiana and North Dakota. • UNI heads back on the road, this time to Champaign, Illinois for the Ball State Active Ankle Challenge. The Panthers face Ball State and Indiana Friday and North Dakota State Saturday. • After winning all three matches at Ball State, three Panthers were named to the All-Tournament Team. Karlie Taylor was named the Tournament MVP and Piper Thomas and Kendyl Sorge were honored. • UNI had an outstanding opening weekend and caught national attention. UNI jumped into the AVCA Poll at the No. 17 spot after not receiving a vote in the preseason poll. UNI now sits just outside the top 25. • Karlie Taylor was named the MVC Conference Player of the Week in week one after leading the Panthers in kills and points and earning a spot on the Trojan Invite All-Tournament Team. Rachel Koop also earned All-Tournament Team honors. • The Panthers were picked to finish first in the Missouri Valley Conference after finishing second last year. 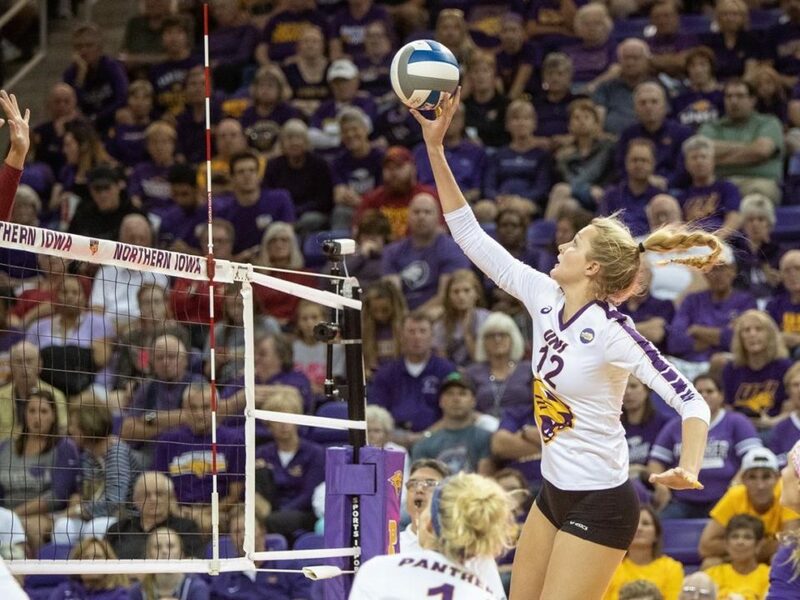 • UNI returns four of seven starters from a season ago, including MVC All-Freshman honoree Jaydlin Seehase and kill leader and First-Team All-MVC honoree Piper Thomas, but must replace First-Team All-MVC honoree Bri Weber and MVC Setter of the Year Heather Hook. • The Panthers rank No. 8 all-time in NCAA Division I winning percentage (.773). UNI trails only Penn State (.863), Hawaii (.852), Nebraska (.843), Florida (.833), Stanford (.813), BYU (.778) and UCLA (.774). • UNI, Hawaii, Nebraska, Stanford, Penn State and UCLA lead the nation with 37 consecutive non-losing seasons in NCAA Division I volleyball. • UNI has posted 32 straight NCAA Division I winning seasons – the fifth-longest active streak in the nation behind Hawaii (37), Nebraska (37), Penn State (37) and Stanford (37). • Head coach Bobbi Petersen is entering her 19th year at the helm of the Panther program with a record of 461-141. She has led the Panthers to 13 NCAA Tournament appearances. Live radio coverage of the UNI Panther volleyball team can be found on www.UNIPanthers.com and KXEL (1540-AM). All audio this year will be free of charge (no subscription service). Chris Kleinhans-Schulz will again be the play-by-play voice for the Panther volleyball squad. The Lipscomb and Creighton matches will be available on FightingIllini.com. The Illinois match will be available on BTN Plus. The Bison are 5-4 on the season with losses against tough teams including Tennessee, Arizona, Pacific, Louisville and Purdue. They have wins over Iowa, Xavier and SMU. Carlyle Nusbaum leads the way with 4.39 kills per set and has recorded double-digit kills in every match this season. Saturday’s match is the first between Lipscomb and UNI in program history. Illinois started the season ranked 12th in the AVCA Preseason Poll and they’ve done nothing but show that they deserved that ranking and more. They have wins over ranked teams in Colorado State, Colorado and Washington. Jacqueline Quade leads the Illini at 4.14 kills per set, Megan Cooney is second on the team at 3. 59 kills per set. The team has a .302 attack percentage. Illinois leads the all-time series 0-2-1with the last meeting coming in 1986. The Jays won five of its last six matches including wins over Iowa State and Wichita State. Their losses came against UNI, No. 7 Nebraska and No. 10 USC. Three returning All-Americans pace the Bluejays. Senior outside hitters Jaali Winters (3.97 kps., 3.57 dps.) and Taryn Kloth (4.31 kps., .271%), as well as 2017 BIG EAST Libero of the Year Brittany Witt (4.37 dps.) all were named Preseason All-BIG EAST this season. Winters was named MVP of last week’s Bluejay Invitational, while Kloth joined her on the All-Tournament Team and had 64 kills in three contests last week. UNI leads the all-time series 42-9.